Why Does My Ferret Grind Her Teeth on Her Food Dish? 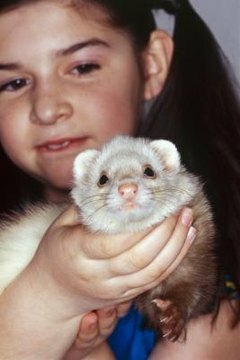 Ferrets have 28 deciduous teeth and, as adults, they have 34 permanent teeth. The first set typically erupts when your pet is around 3 weeks of age. These will fall out at around 10 weeks, making way for the permanent teeth. At any point during the dentition cycle, your ferret may exhibit teeth-grinding behavior, often using hard items such as the food bowl as a chewing target. When the teeth are erupting through the gums, inflammation can occur. This happens during both dentition phases. Whether its the first or second set, this process is informally referred to as “cutting the teeth.” During this process, your ferret may attempt to alleviate the gum discomfort by grinding her teeth on the food bowl. If your ferret doesn’t have access to hard chew toys, she’s probably using the bowl simply because it’s an easy and accessible outlet for her chewing. This behavior will normally stop when the inflammation abates. In the meantime, it’s essential to ensure your ferret has access to safe toys so she can direct her teeth-grinding instincts appropriately. Ferrets often chew as a means of redirecting the feelings of pain the experiencing elsewhere in the body. For example, a ferret suffering from a stomach illness may find relief in chewing on a food bowl. This behavior typically stops when the discomfort has receded, but it's important to identify the cause of the pain. If your pet is hunched over while chewing, it may be a sign of gastrointestinal discomfort caused by stomach ulcers or a bacterial infection. Dental pain not related to the growth of new teeth may also cause unwanted tooth-grinding behavior. Check the roof of her mouth and look for signs of redness and inflammation caused by ulcers resulting from the onset of Helicobacter disease. If you spot any redness or inflammation, take your ferret to the veterinarian as soon as possible. A hairball trapped in the stomach or the presence of a foreign body trapped in the mouth or digestive tract can cause your ferret to grind her teeth. In the case of hairballs, she may be able to expel the item without veterinary assistance, but if the grinding behavior continues for more than a day -- or if you observe other symptoms getting worse, such as lack of appetite or unusual elimination -- visit the vet for diagnosis and treatment. Why Do Chinchillas Lose Lots of Hair? Why Is My Hamster Wet Around His Mouth & Belly? How Long Does It Take for Ferrets to Give Birth? Do Pet Hamsters Need to Chew Wood?